7/221 [Medieval manuscripts]. Pelekanidis, S.M. (a.o.). The Treasures of Mount Athos. Illuminated Manuscripts. Athens, Ekdotike Athenon, 1974-1979, 3 vols., 496; 399; 327p., num. (full-p.) col. ills., orig. unif. gilt and dec. rexine w. dustwr., 3 orig. slipcases, folio. Will be auctioned at the november 2007 auction Bubb Kuyper, Haarlem, Holland. 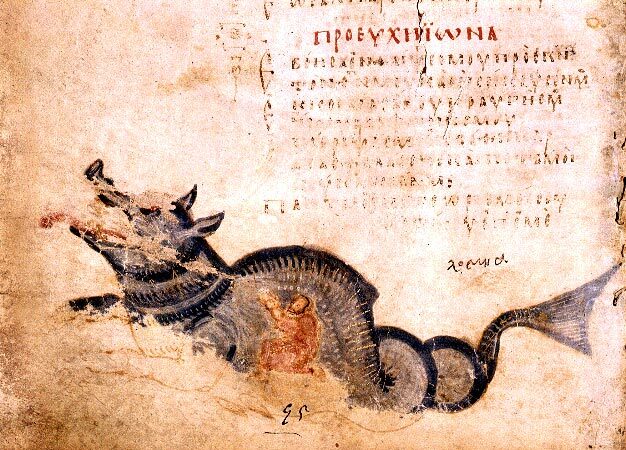 Miniature representation of Jonah in the belly of the whale, in codex no. 61, 9th century, Pantokrator monastery, Mount Athos. This entry was posted in history and tagged manuscript. Bookmark the permalink.